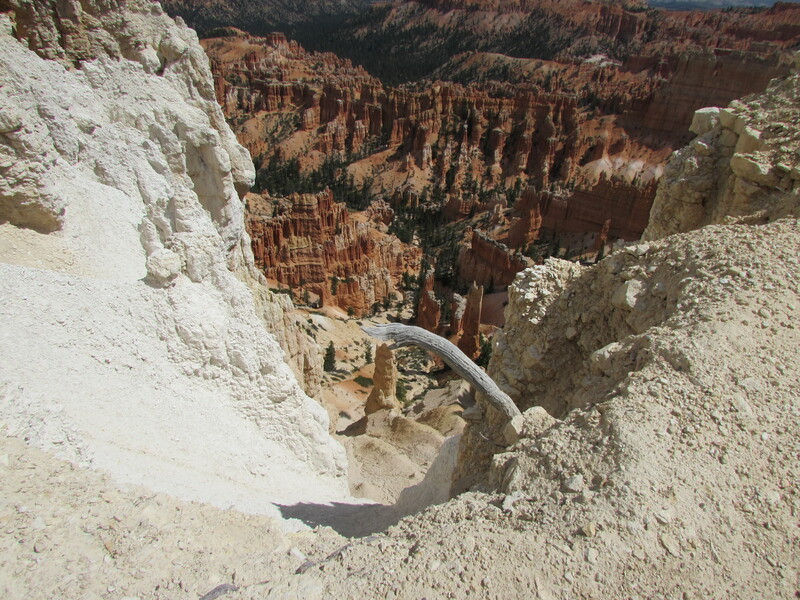 The National Park Service map of Bryce Canyon National Park says that the Queen’s Garden trail, the most popular trail at Bryce, is an easy to moderate hike with “gentle grades & minimal elevation change.” Don’t you believe them. It’s an into-the-canyon trail that goes straight down. And you have to take that straight down trail straight back up. 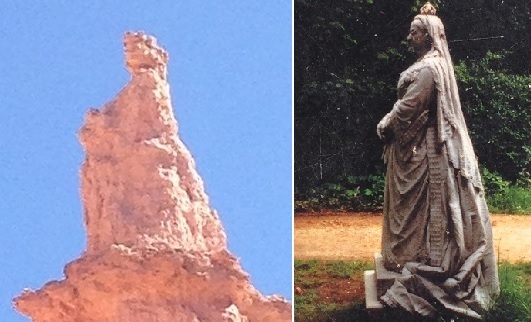 But at the end of the trail, you get to see a hoodoo of Queen Victoria. So, Anglophile that I am, I had to do it. Fortunately, it was only a mile each way. “Hoodoos,” just in case you, like me, had no idea what they were, “are tall skinny spires of rock that protrude from the bottom of arid basins and … are most commonly found in the High Plateaus region of the Colorado Plateau and in the Badlands regions of the Northern Great Plains.” This from the NPS website. Bryce, in southern Utah, has a boatload of them. Or more accurately, a canyonload of them. 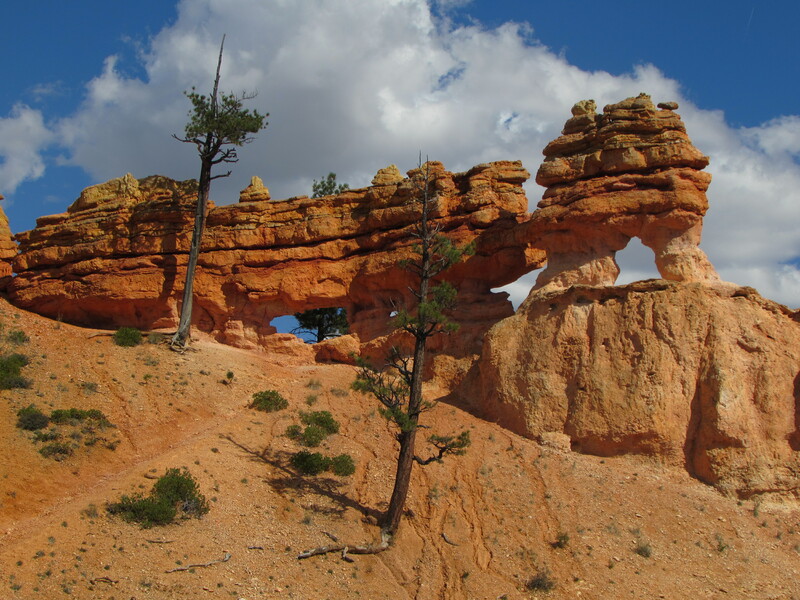 The Queen’s Garden trail starts less than a mile from Bryce Canyon Lodge. So after our audience with the Queen, we walked to the Lodge for lunch. Bryce Canyon has one of those classic, Arts and Crafts style lodges, of which I inexplicably have no photo. 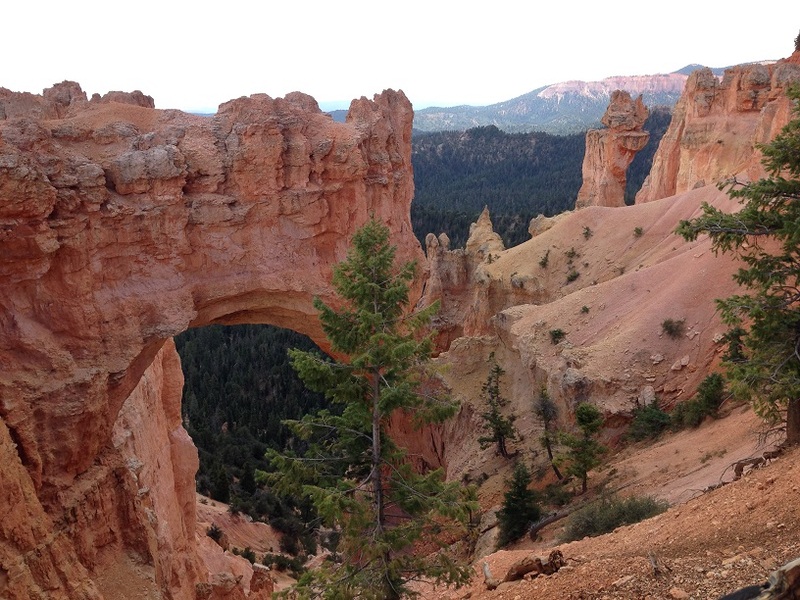 After lunch, we walked the rim trail to Sunset Point and the start of the Navajo Loop Trail. We intended to take Navajo Loop and try to work our way as far down the canyon as possible. But after about a mile, lightening and thunder started. Directly above our heads. Surrounded by trees, we weren’t about to take any risks. It’s amazing how fast one can run, uphill, when scared witless. The next day, we drove to Fairyland Point, the start of an eight mile loop that goes down the canyon and up again, then swings back to the point via a rim walk. I knew I wouldn’t be able to do an eight mile hike with a 1716 feet elevation change. So we hiked as far as I could, then turned around. There’s a hoodoo formation called Tower Bridge on this trail that I would have liked to have seen, but we didn’t make it that far. Still, we “saw some things,” as Mr. History Tourist has been telling everyone. Another lunch at the Lodge, then a drive to a parking lot outside the park, for a short and easy wander along a stream to Mossy Cave. The description says that it’s a grotto that “fills with spectacular icicles [in] winter.” In the September, though, it’s just eh. Along the same trail were an okay waterfall and some nice arches, which made the walk worthwhile. I tried to get a reservation at the Bryce Lodge (and at the Zion Lodge), with no luck. Someone we met at Bryce, who was retired from the park service, said that we needed to find out what day booking opens for a particular date at a particular lodge (for most park lodges, it’s 12 to 16 months out), and call as soon as it opens. For the more popular parks, he said, we probably couldn’t get anything closer than about a year out, because we’d be competing with tour companies that have large banks of operators booking large blocks of rooms as soon as they’re available. But he said to try anyway, because people (and companies) cancel and there’s an off chance of getting a room closer to our travel date. Which brings me to the worst hotel we’ve ever stayed in: the Red Ledges Inn in Tropic, Utah (which I mistakenly thought was the closest town to Bryce — it’s not so definitely look elsewhere). 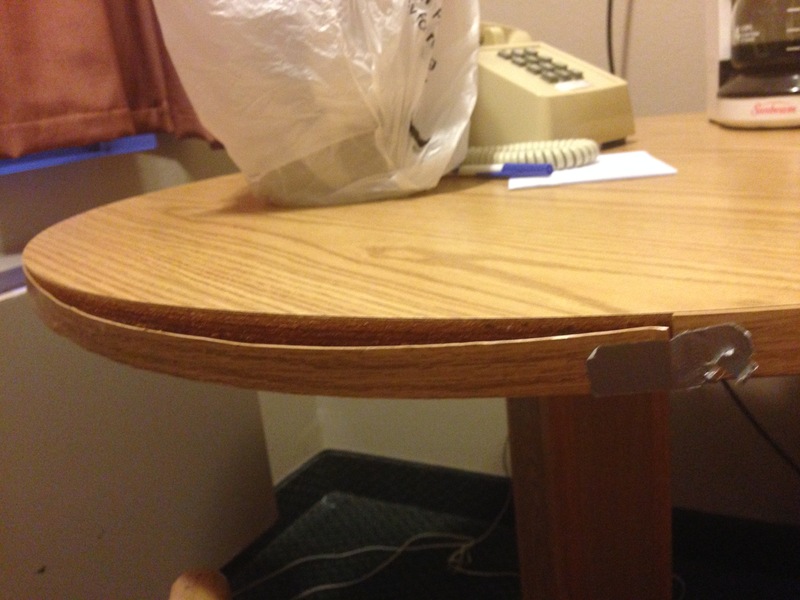 The furniture was held together by duct tape, as you can see from the photo above. The walls were stained, the bathroom was full of mold and they had the surliest morning receptionist in all of hoteldom. I won’t test your nausea quotient by showing you photos of the stains and mold, even though I have them. My lukewarm opinion of Bryce — that it was lovely but not somewhere I feel a need to return to — is probably clouded by my hotel experience, so I’m willing to give it another chance, someday. But only if there’s a better hotel available. In two days, I’m off to visit friends and family in the DC and Philadelphia areas. I’ll be back in two weeks, to pick up the Utah national parks trip posts. Meanwhile, follow me on Twitter, if you’re so inclined, for regular updates from Colonial Williamsburg, the Smithsonian museums, and other favorite haunts in the mid-Atlantic region. It was one of my favourite parks but we didn’t stay at your motel. I didn’t spend enough time in Bryce and need to go back. 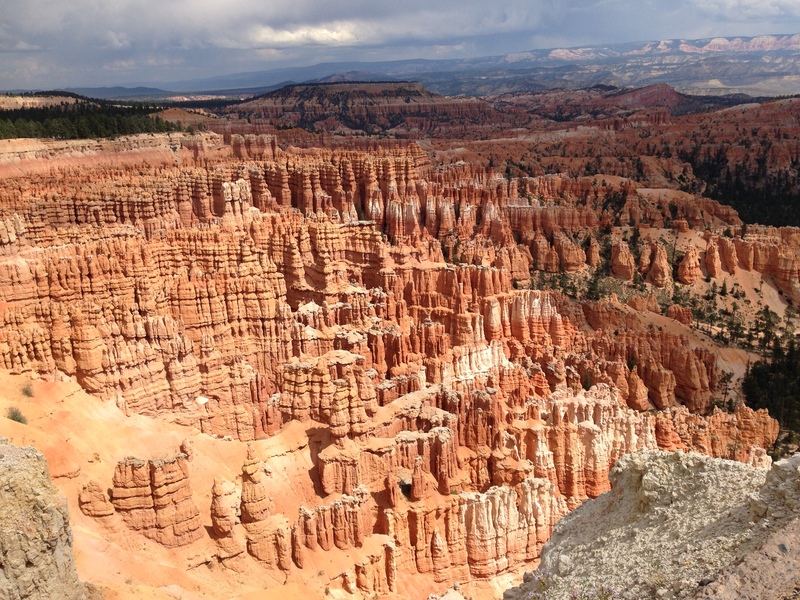 It – and all of the southern Utah parks — were amazing. We definitely want to go back and spend more time at each.